War-weary from months of fighting, one community attempts to co-exist with rebel militias. On Easter Sunday, the churches that follow the traditional Christian calendar in this Syrian border town lay empty. They haven’t had services for four months, and most of their congregations have fled or are picking through the rubble. Some fear that another round of fighting will break out. 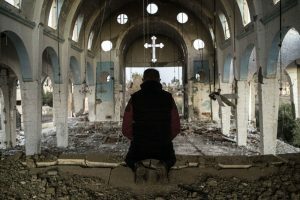 A recent spate of kidnappings has also cast a shadow over the Christian residents of this diverse city in northeastern Syria. Starting in November, roughly four months of fighting devastated the city. The Free Syrian Army, along with Islamist groups like Jabhat Al-Nusra, attacked Assad regime soldiers. After regime soldiers were forced out, the rebel coalition then battled the Kurdish militia known as the Popular Defense Forces (YPG), They fought pitched battles throughout the city streets as the Assad regime continued to send aircrafts on bombing runs. During the last phase of the fighting, in which the FSA fought the YPG, Abdulahad lay trapped in his apartment for 17 days, subsisting on very little water and stale bread. Many residents fled the city, with some activists speculating that 65 percent of the total population had left. 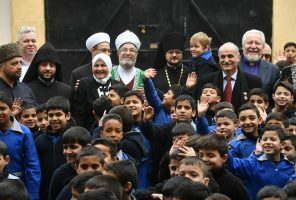 In February, Syrian Christian dissident Michel Kilo brokered peace between the factions. Some residents have returned, despite power cuts, water shortages, and the constant presence of various armed fighters. Ras al-Ayn, located along the border with Turkey, is a city of 50,000 with a diverse population of Kurds, Arabs, Assyrians, Turkmen, Armenians, and Chechens, and it’s home to three Christian churches. 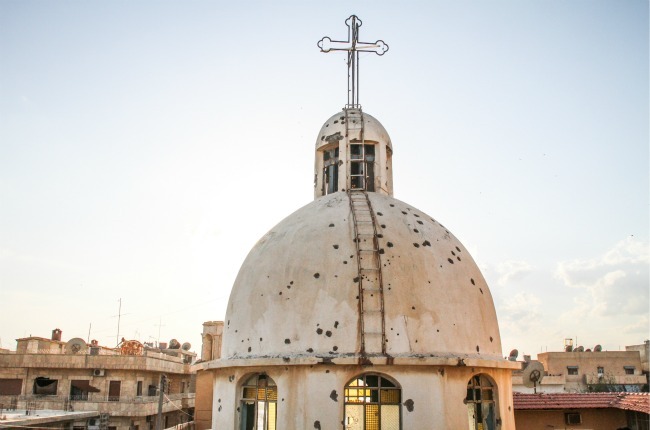 Christians make up an estimated 10 percent of Syria’s 23 million citizens. Issam Bishara, regional director of the Catholic Near East Welfare Association, recently told Asia News that approximately 300,000 Syrian Christians have fled the country. The increased sectarianism in the conflict, especially the growing influence of Jihadi forces, has left many fearful of what’s to come. Prior to the conflict, many saw Ras al-Ayn as a beacon of tolerance between Muslims and Christians. Residents say that they there is still a camaraderie among the citizens that live there, but that problems arise from those fighting who don’t live in the city, be they FSA, YPG, or Islamists. Still, Jean says he would not venture to the area where Jabhat had set up their base. “They are so religious, maybe they think that I’m a nonbeliever and then, I don’t know,” he added, trailing off. 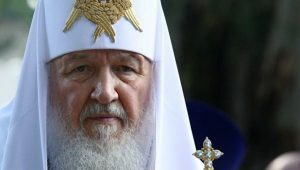 In an article written for a Christian Orthodox website, Syrian Orthodox Archbishop Eusthathius Matta Roham called the Islamists, without naming Jabhat specifically, a great threat to the lives of Syrian Christians in Ras al-Ayn. He also praised the YPG for rooting out the rebels and protecting the Christian neighborhood. Previously she had studied in Aleppo, but she rarely leaves her neighborhood now. Of particular concern to the Christians is kidnapping, which only some would admit seems specifically targeted at Christians. The week before we arrived, two local Christian men were kidnapped after they went searching for a stolen car. It’s unclear who’s doing the kidnapping. Many speculate it’s simply criminal gangs trying to make money. Elias’s uncle, Joseph Karmo, described in detail how he was kidnapped twice. The first time, he was in a car near the church. A group of armed men drove up and told him they needed medicine from the closed pharmacy where his brother works. Then they grabbed him and drove him three hours to the countryside of Aleppo. He was held for seven days. They didn’t beat him much, but they showed him pictures of dead people. “They asked my family for money, and they said, ‘If they don’t pay, we’ll kill you like this,'” he said.